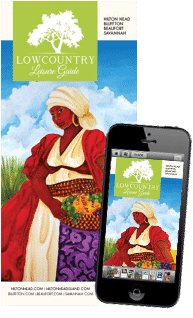 Exploring a place either foreign or familiar is not unlike being told a story. 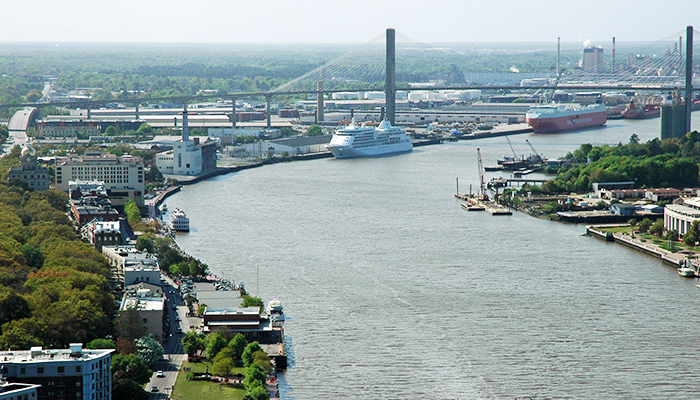 When it comes to peeling back layers of Savannah’s biography, a variety of storytelling modes exist—from guided trolley to ferry to helicopter tours. 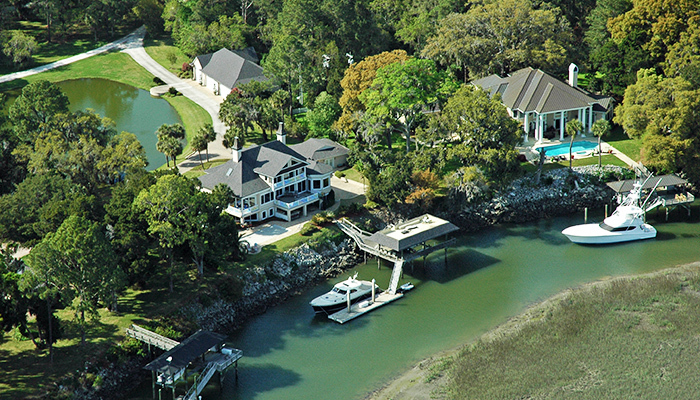 It is quite possible for one to get to know Savannah by road, river and aerial view. 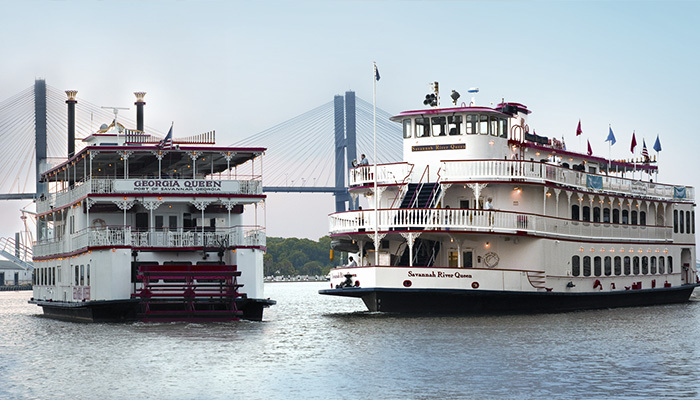 Visitors can tailor their traveling pace to the city’s color, because seeing Savannah is not equal to experiencing her legend. 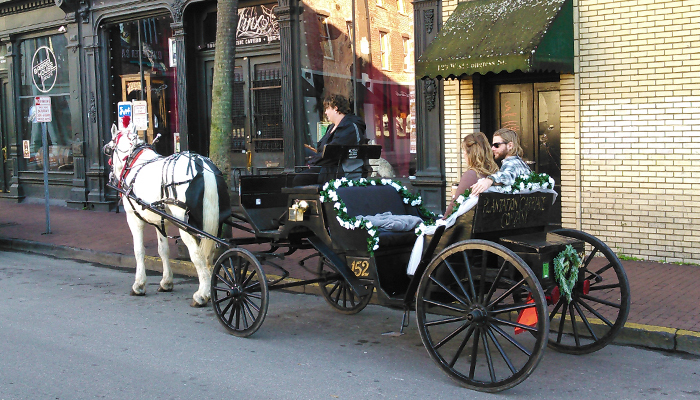 Spend a few minutes strolling through the Historic District and you will most likely spot a parade of trolley tours square-hopping and transporting tourists past some of the city’s most notable features. 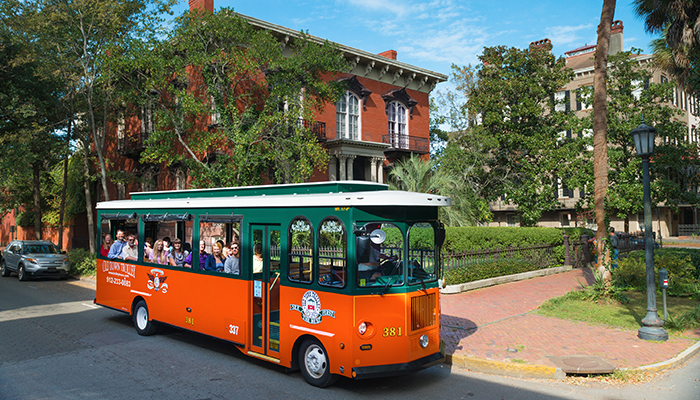 Old Town Trolley Tours are distinctive for their orange and green designs, as well as their popular tours. 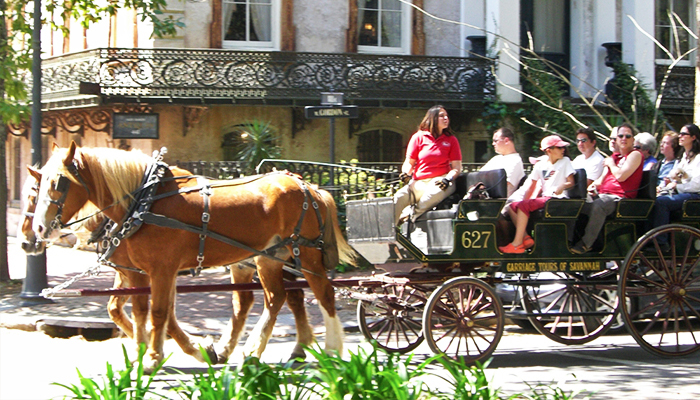 Similar in name but contrasting in decor, Old Savannah Trolley Tours heightens its intimacy with Savannah’s history through historical interpreters, making for both entertaining and educational visitor interactions. 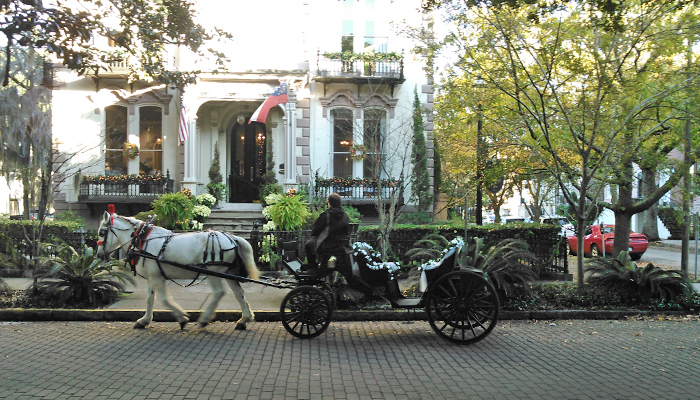 These two companies practice the “get-on, get-off” method of touring, giving tourists the luxury to explore Savannah at their own rate and leisure. 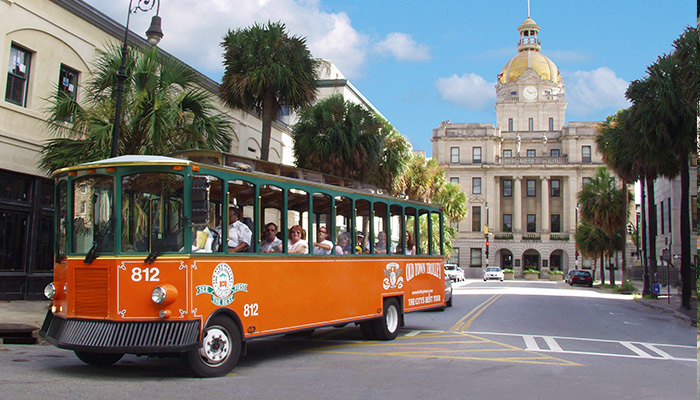 Trolley stops for both are uniquely marked throughout the Historic District, and the trolleys return to each stop in intervals of about 15 minutes. 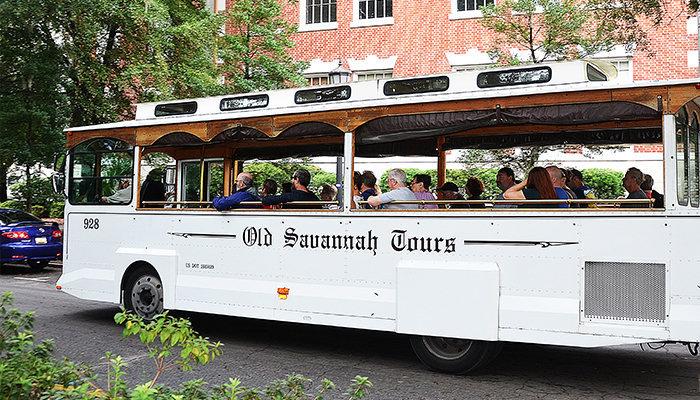 If the “get-on, get-off” approach is not your speed, Old Savannah Tours offers an alternative with uninterrupted, comprehensive tours, such as the 90-minute Historic Overview Tour and three-hour Savannah Experience. 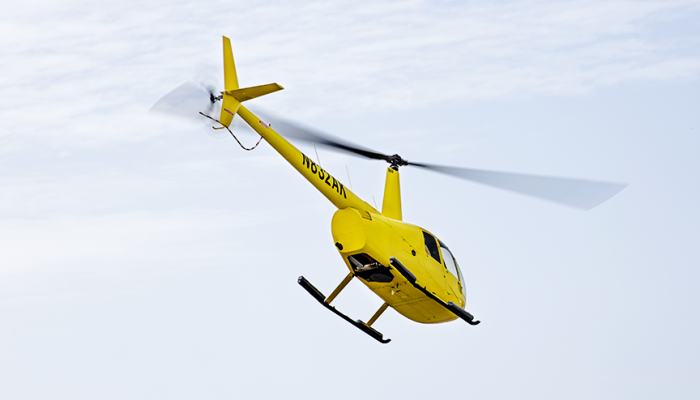 Cruising down Bay Street on a trolley almost gives you the sense that your window-less vehicle is prepping for flight. 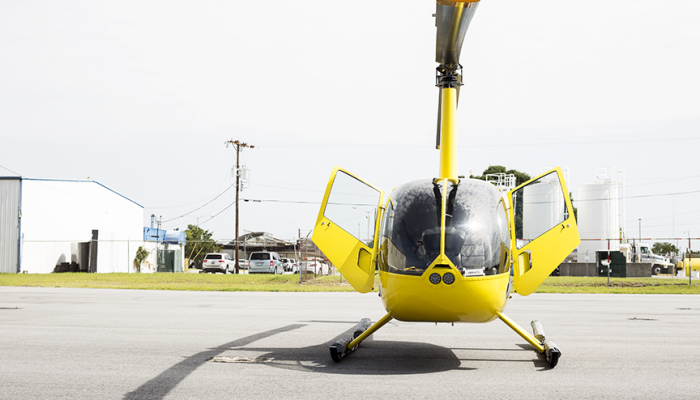 Though the laws of gravity and the mechanics of automobiles don’t allow that (yet), flying over the Hostess City of the South is certainly not wishful thinking. 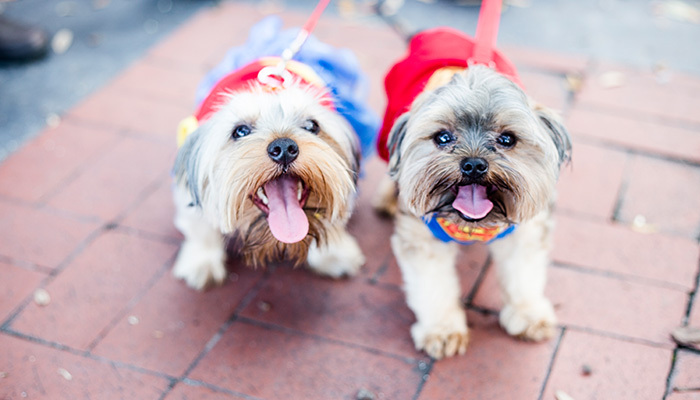 In fact, it sounds rather, dare I say it, uplifting. 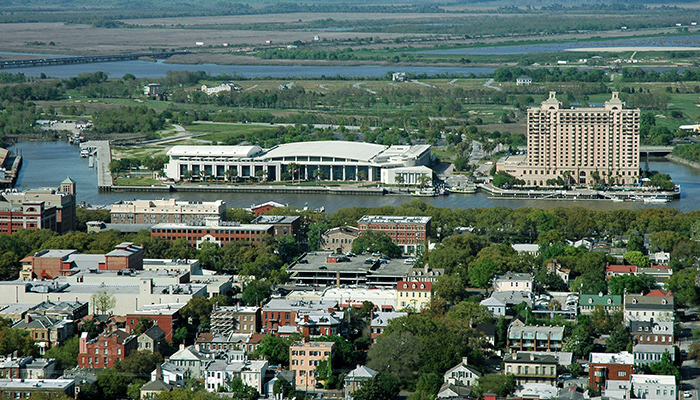 Helicopter Tours of Savannah provides an unmatched perspective of the city with several sightseeing selections from views of downtown to Old Fort Jackson and even the Talmadge Bridge. 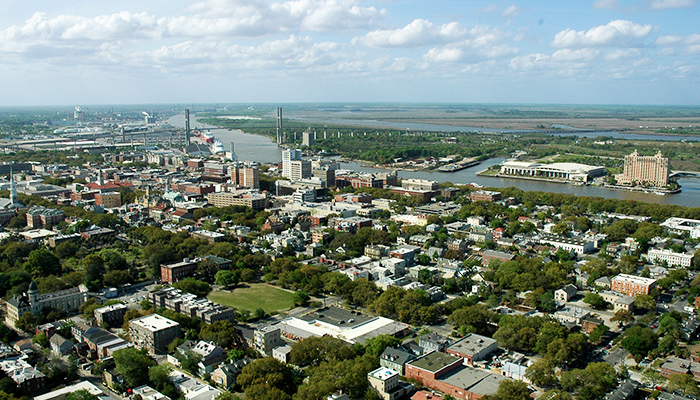 Man is not the sole proprietor of Savannah’s past. 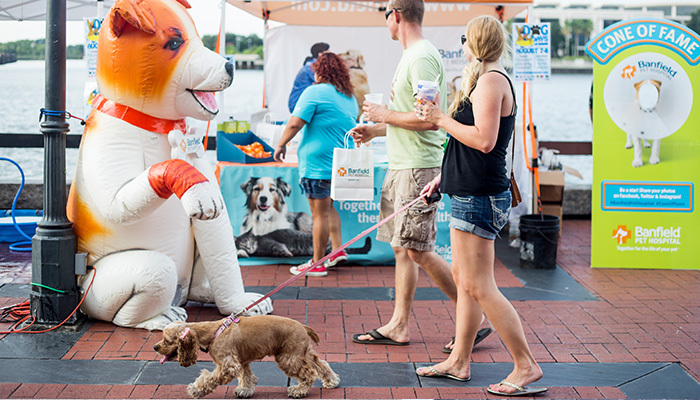 Canines also claim significant roles in some of Savannah’s most bizarre and inspiring narratives. 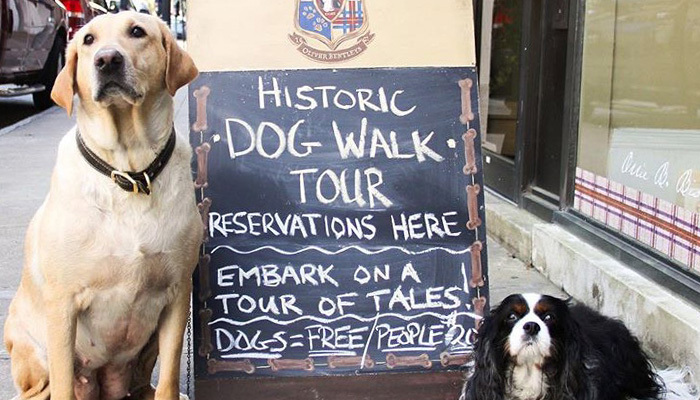 On Oliver Bentley’s Historic Dog Walk Tours, man’s best friend gets the VIP treatment with a specialized historic walking tour for dog owners and lovers alike. 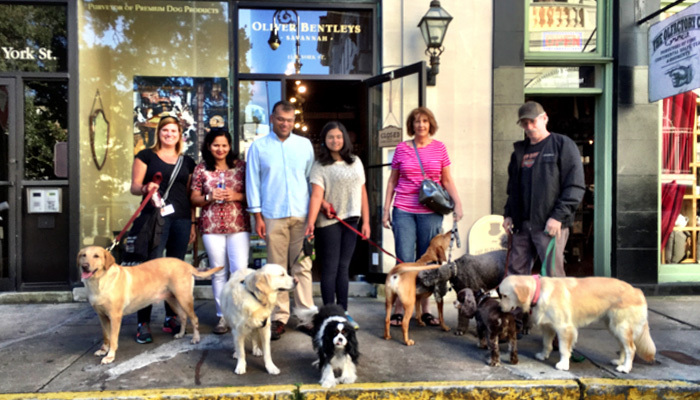 Nothing quite compares to strolling the streets with wonderfully walking tours, which you, your family and furry friend can enjoy. 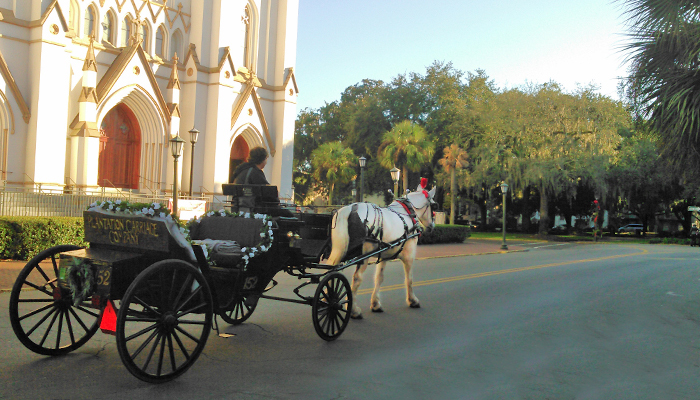 Savannah’s stories are often embedded in the details of her architecture. 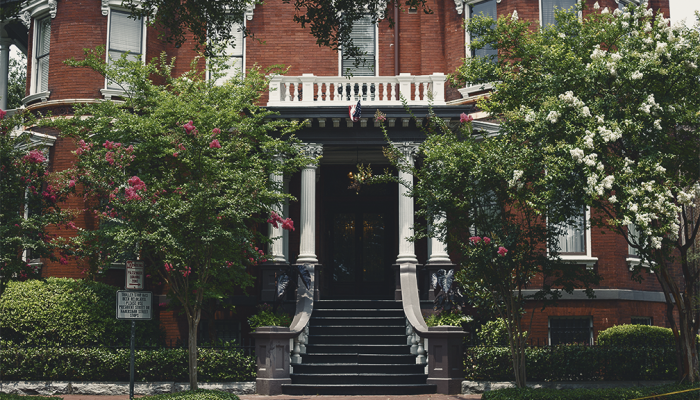 One of the best ways to appreciate the technicalities and purposes behind the framework of Savannah’s most famous estates is to take a walk with Architectural Tours of Savannah. 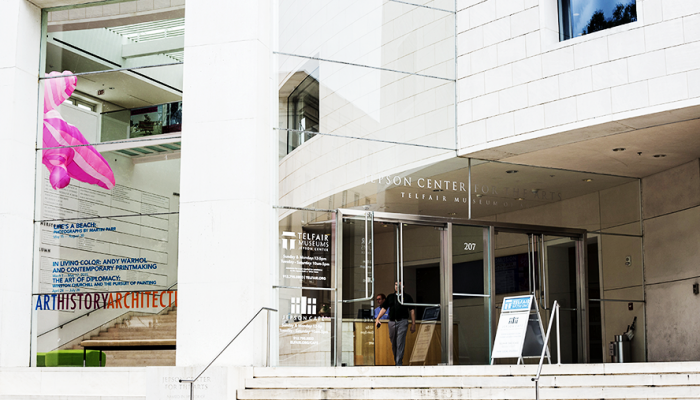 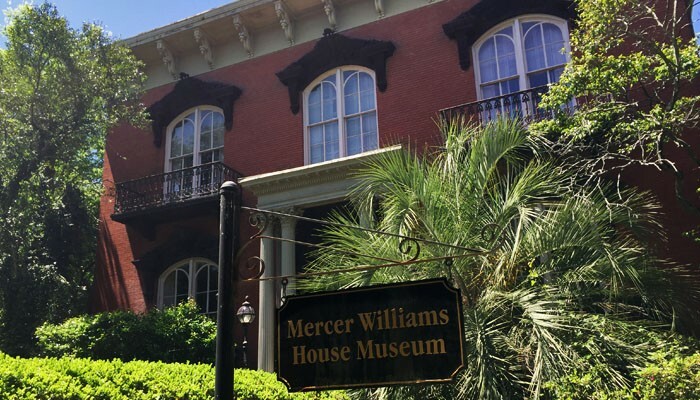 With a local who graduated with a Master of Architecture from the Savannah College of Art and Design as your guide, this tour starts with the oldest buildings in Savannah and highlights the major periods and styles that have lead up to today. 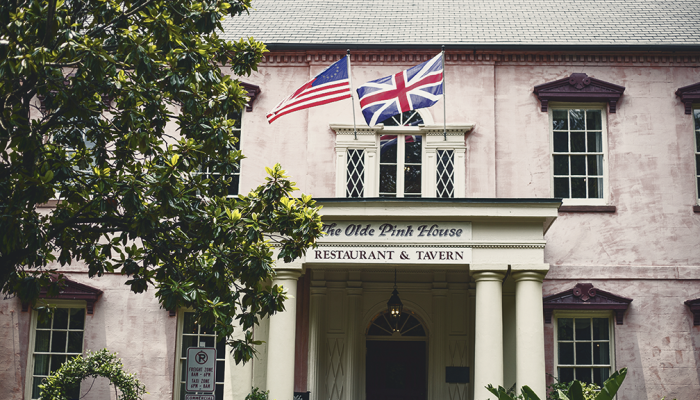 Character defines almost every element of Savannah’s cultural fabric, and the culinary arts are no exception. 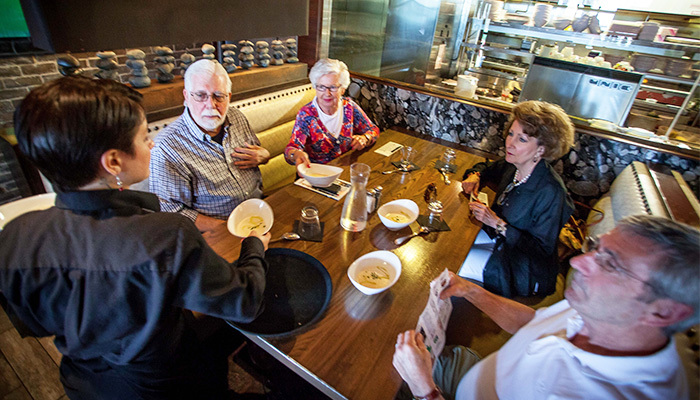 Walking tours have the potential to double as both a workout and a meal. 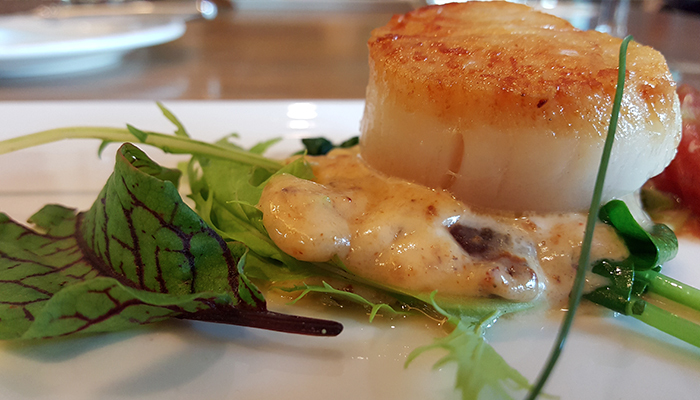 It’s genius because all the walking cancels out the calories (which don’t count on vacation anyway). 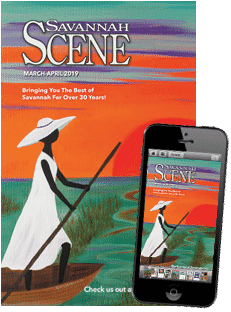 The beer connoisseur in your group can learn about the roots of Savannah’s craft beer scene in Savvy Savannah’s Savannah Suds tour. 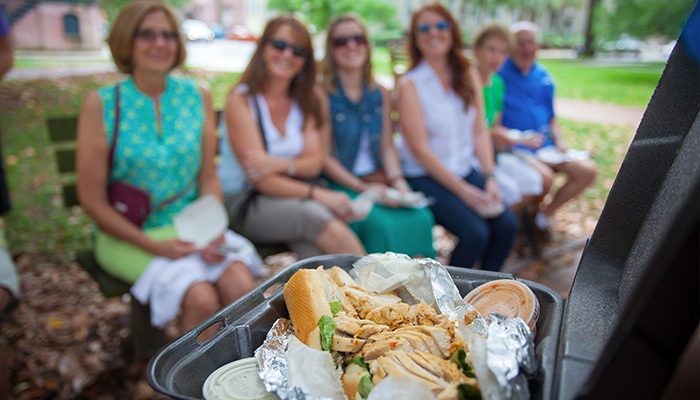 To balance out the beer, sample some of the city’s best local eateries during Savvy Savannah’s tour of tastes, Savor Savannah. 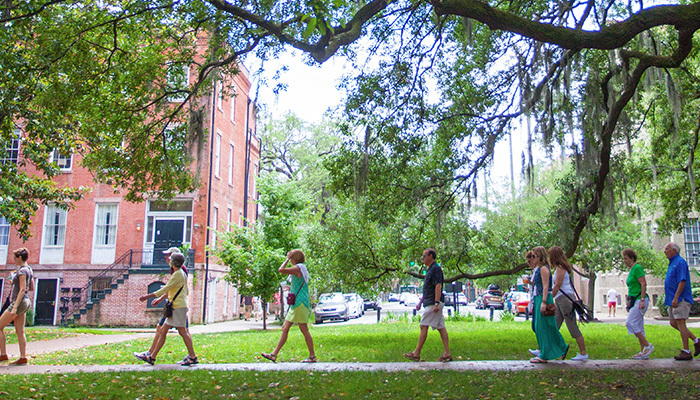 The Savannah Taste Experience develops this idea further through a three-hour walking and tasting tour through the Historic District’s landmark gardens and squares, with a First Squares Food Tour and Famous & Secret East Side Tour. 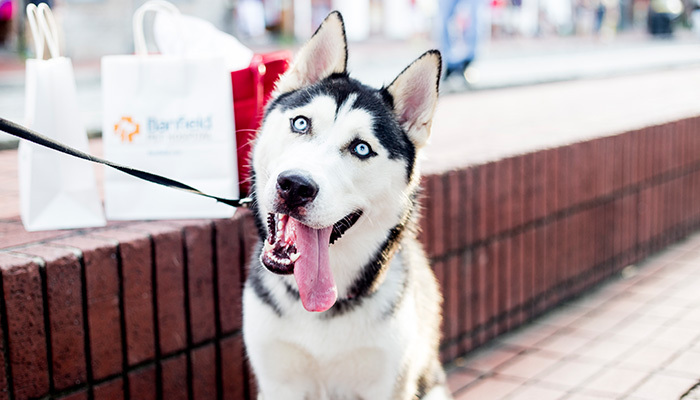 Walking in Savannah undoubtedly works up a sweat and an appetite. 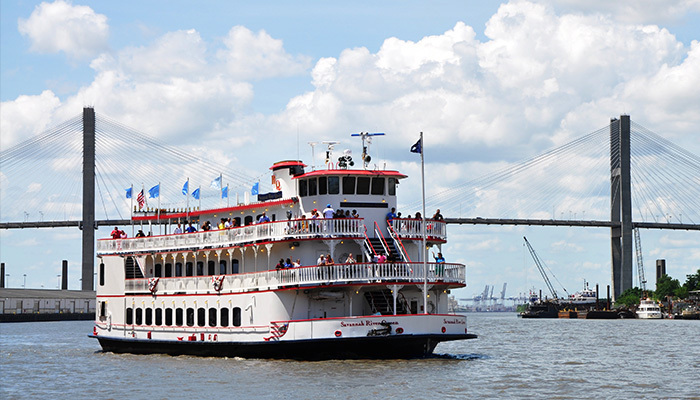 When the temperature reads 90 degrees, nothing beats the swelter or humidity levels like an afternoon spent in the breeze, boating on the Savannah River. 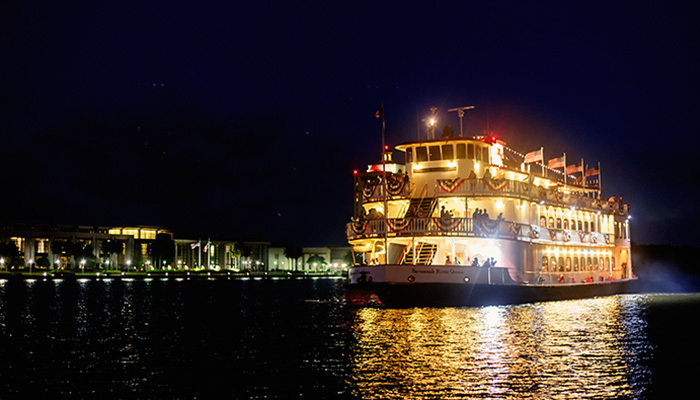 Savannah Riverboat Cruises provide a refreshing view of the city harbor during an engaging evening of dining and entertainment. 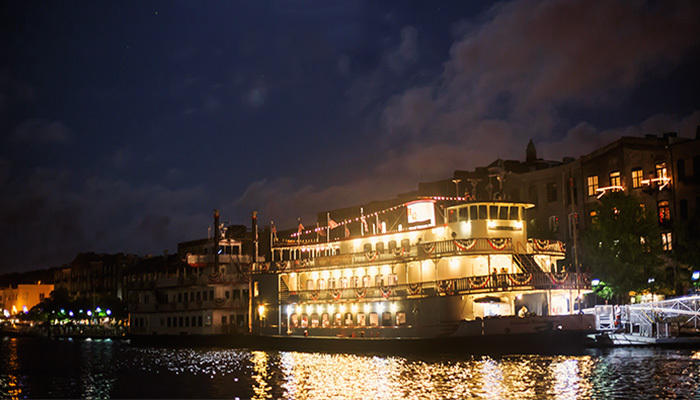 The Savannah Riverboat Cruises certainly make for a special date, but a couple’s carriage ride brings an enchanting evening alive. 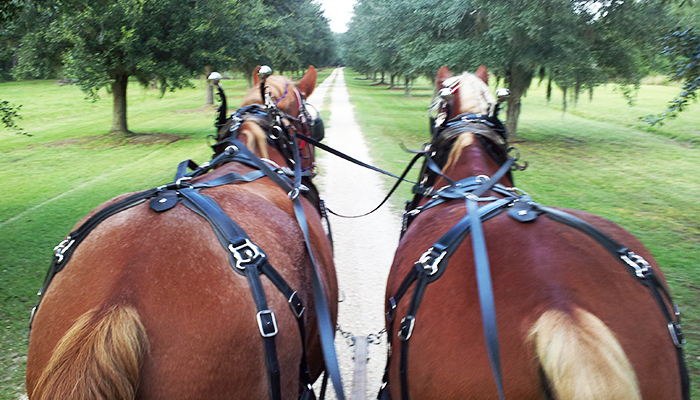 Carriage Tours of Savannah, Historic Savannah Carriage Tours and Plantation Carriage Company all offer intimate adventures that make for a wonderful way to surprise your sweetheart. 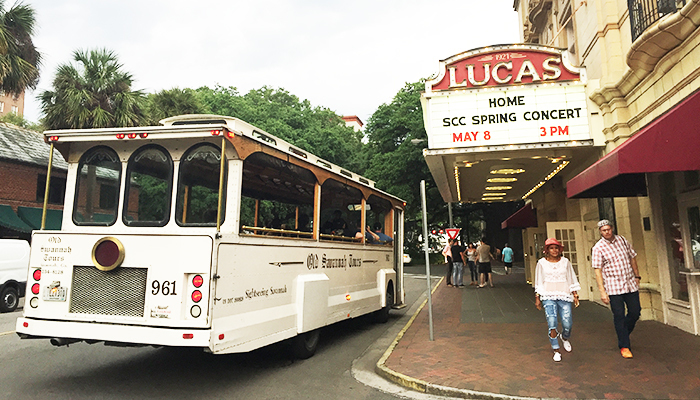 In addition to serene sightseeing excursions, they offer group and ghost tours, as well as historic trolley tours that allow visitors to see Savannah at a leisurely pace. 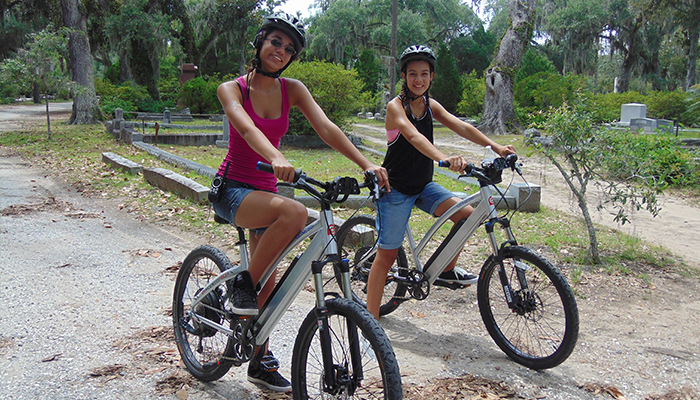 Adventure Tours in Motion caters to all sightseeing preferences aboard a Segway or electric bike, whether you’re curious to learn a specific area of Savannah history or intrigued by the haunted homes and their supernatural residents. 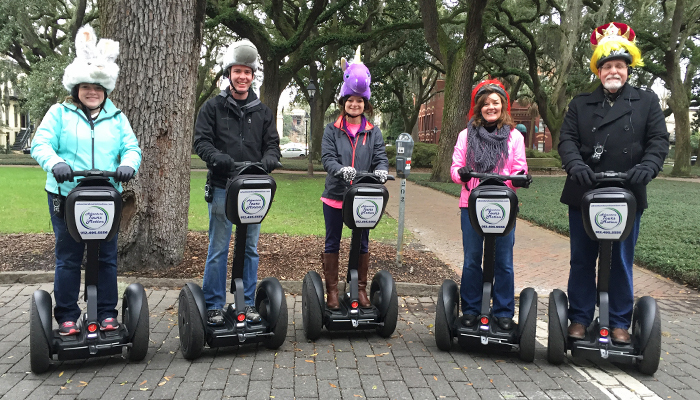 Among the company’s excursions are Segway Historic Tour, Seasons of Savannah and Segway Ghost Stories. 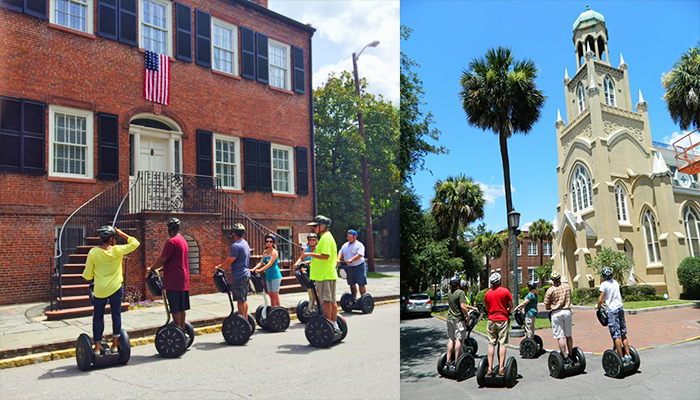 They even offer a Movie Tour, which takes guests on the one-time set of several movies filmed in Savannah, including “Forrest Gump,” “Midnight in the Garden of Good and Evil” and “Something to Talk About.” But they aren’t the only ones zipping visitors on trips around town; Segway of Savannah has their own set of scenic outings. 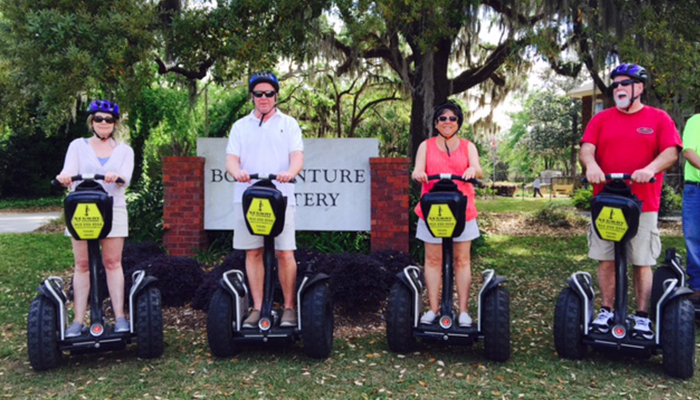 With Bonaventure Cemetery Tours, Laurel Grove Cemetery Tours and 60- or 90-minute Historical Squares Tour, Segway of Savannah allows guests to glide through Savannah’s elegant cemeteries and discover the serene squares without breaking a sweat like those sauntering Downtown Savannah.